It is called "Not Speaking for Me", which is the title of a song by a folk group called The Young 'Uns, (sorry, I can't find the song on youtube) but everything they do is worth a listen) and was the result of my sense of profound alienation at the time of the Brexit vote. It's not so much about my opinion on the result of that vote as a reflection of the fact that during the entire debate I didn't hear voices on either side talking about any of the things that mattered to me, and I found myself wondering if I even belonged here. I'm still wondering, but making this quilt definitely provided some sort of catharsis for the deep despair I felt initially. I ended up binding with a plain blue, but not before I had an odd, and irritating experience with the print I initially chose, which turned out to have been printed just off grain. I cut the first strip and saw that the linear pattern curved gently from one end to the other. Naturally I assumed this was my error, so lined up the selvages, trimmed, cut another strip and yes, the pattern was still wonky. When I checked with a quilters rule it was clear that it was the pattern that was off, not my cutting. I've used very similar prints before, but never had this problem. Ah well, now I've got several neat strips with very wonky pattern placement - I'm sure I'll find a use for them sooner or later. Started on 16th August 2016, and piecing finished on 21st November 2016. I started quilting on 7th January 2018, finished 28th April 2018. Made with fabrics from stash,and a couple of second-hand white shirts (this was the last quilt I made which didn't start with a pull from the shirt stash). The wadding is Sew Simple SuperSoft Eco Blend, which is a 70/30 mix, but made entirely from recycled materials. Quilted with a selection of perle threads, again from stash, and bound with a lovely blue Oakshott. Linking up with Kathy for Slow Sunday Stitching. Now, what am I going to sew today? You can see your despair in this quilt and that is what makes it all the more beautiful. Living in the current US political climate I totally understand how this came about. It is wonderful that we can turn to our craft to work through our problems to some extent and make something beautiful out of pain. This is amazing!!! You might have started out feeling despair but ended up with a powerful striking quilt! Stupendous finish -- congratulations!!!! First r-w-b that truly makes me stop and look deeply. Well done. A stunning finish. We feel your pain. I Just love it!! Super fun quilt...I watched the Brexit with great interest from over here. I feel your pain (here in the states). But, this quilt is just stunning. Congratulations on making the commitment to the finish and seeing it through! And thank you so much for the backstory and inspiration for the project. It's amazing how left out of the political landscape I have been feeling, and as a result how drastically my husband and I plan to check out of the culture and economy. Such a beautiful quilt, love the colors, the pattern and the story behind it. Beautiful finish! It must make you feel sooooooooo good. I love the spontaneity of this quilt. I missed this quilt, was wondering how it was going. I still feel depressed about the brexit vote. I actually cried when I heard the result. I really think a lot of those who voted to leave don't realise the long term effects this can have on us as a country. Apart from anything else, I feel European. I love this quilt with its broken circles. A wonderful design. And so meaningful that you choose these colors. 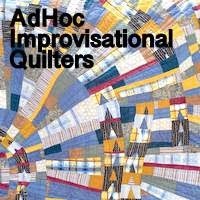 I admire your handquilting ( there is now a pic of a quilting hermit in my head. :-) ) And I understand your feelings. The family of my son in law lives in the UK and that will become more difficult. So sad that so many people are so anxious about the world and their only idea is to lock in their small world. Please, please send this image and your story to The Young 'Uns. They will so much appreciate what they have been a part of. If you have ever been on one of their workshops you will know how welcoming and appreciative of others they are. Absolutely beautiful! THIS speaks for ME...and I'm in America. Thank you for sharing! Again, amazing. Considering the story behind it, will you keep this one for yourself? Many congratulations on your finish Kaja. It was interesting to see in print your thinking with this quilt, we had spoken before about Brexit and feelings of where we belonged so this quilt tells a story! LOVE your quilt. Your improv design is a great expression of your feelings. That is a very striking quilt that shows the strength of your feelings. Well done on the design and the stitching. Congratulations on the finish! I think it is a very powerful piece. I am glad to hear that making this quilt provided some form of catharsis for you. I quite often find myself delving into art when I need that. The quilt is beautiful, Kaja, and if I may be so bold I'd like to say that I can actually see the relation between your quilt and your thoughts. Wow you do have finishes right on top of each other. This is gorgeous! Congratulations on a fabulous finish! As someone else said, it is a powerfully striking quilt. Oh..my oh my oh my...brilliant...wonderful...stunning...and of course...finished...brava..